Madame Alexander - Favorite Friends - 18-inch Mixed Prints has brown eyes and long, center-parted brunette hair that’s fashioned into two braids that are held by white scrunchies. 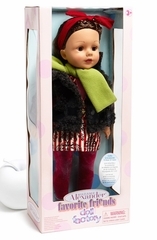 Her eye-catching outfit features a pink shirt under a red, patterned vest, which has nail head buttons. It’s worn with a red and white, vertically, striped skirt, which is detailed with black graphic accents. A studded belt looks fab with her grey tweed, cropped jacket that has black flock patches and pocket flaps. 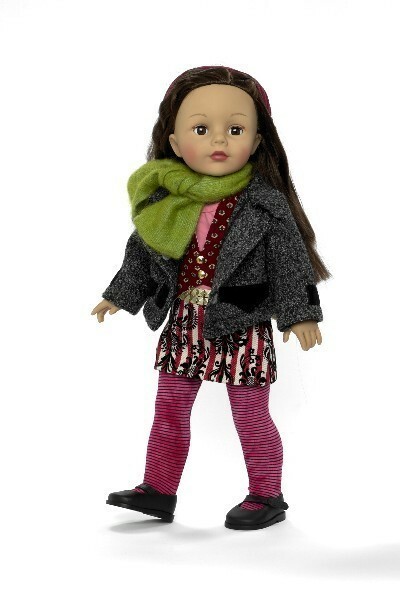 Striped, hot pink tights, black Mary Jane’s and a green knit scarf around her neck completes the very now, very wow, look for Mixed Prints.